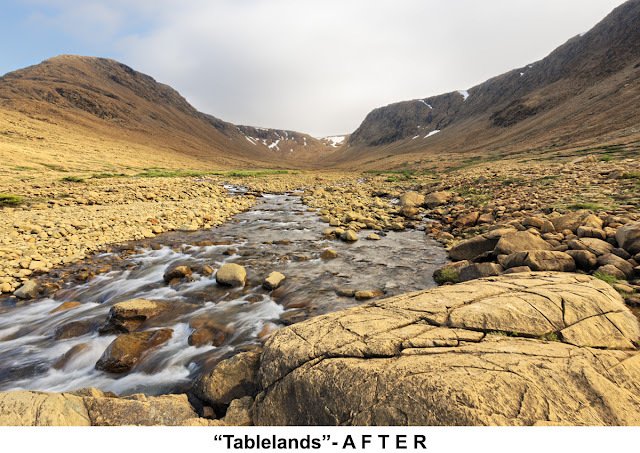 The tablelands of western Newfoundland are a rare geological formation - a piece of the earth's mantle, normally buried seven or more kilometers beneath the earth's crust, but forced to the surface here several hundred million years ago. The area lacks the usual nutrients required to sustain most plant life, and so is nearly barren. The high iron content of the rock accounts for the rusty brownish color. In the BEFORE image the sky is correctly exposed but everything else is badly underexposed. This was fixed with an exposure correction in the RAW image. The BEOFRE image has a slightly bluish color cast which was fixed with a color temperature correction. 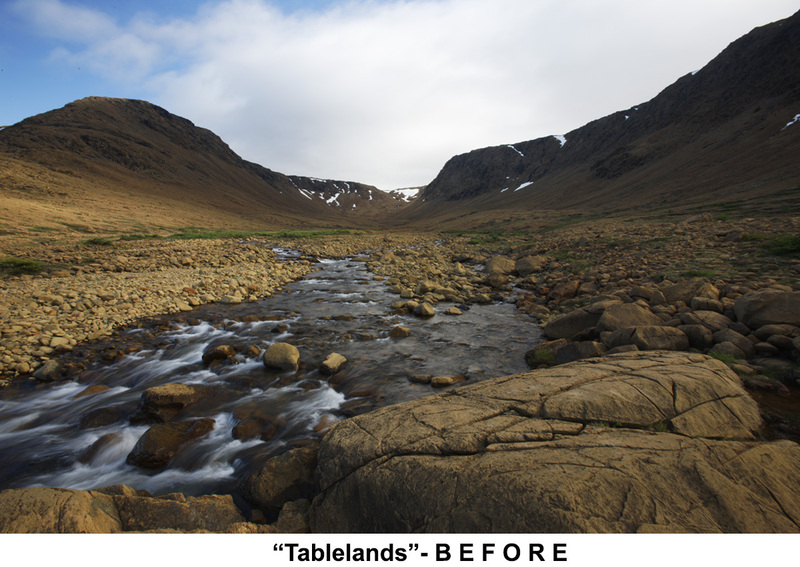 After making those global adjustments, I worked separately on four sections of the image: the sky, the land in the upper part of the frame, the creek, and the large rock that dominates the lower right-hand corner. The overall plan was to bring out the textures and contrast in the rocks, maintain the darker tones in the water, lighten the shadows in the hills, and reduce contrast and detail in the sky. I did this with a series of tone curve and fine contrast adjustments. The layer and masking tools in photoshop allowed me to isolate each section of the image. Finally, I cropped the image a little from the top and the right to make the foreground stronger.